twentyeightfeet: T minus 13 days. My friends are amazing, because of their help, encouragement and generosity, I've had a very exciting year. I've been able to: pass through ten or so countries, direct, shoot and edit an hour long documentary, spend the winter on a small island, watch my friend's first feature film open at Sundance, snowboard dry Utah powder, work on a comedy network series and ride a vintage motorcycle across America. Now my most adventurous friend has invited me to sail over 3600km with him and his father from Mahone Bay, Nova Scotia to Bridgetown, Barbados. 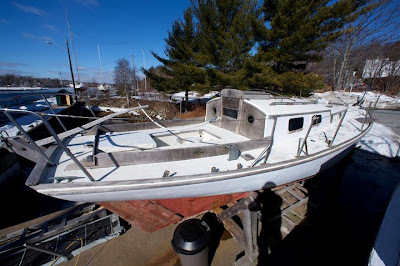 Last year Dave Welsford (who I call NewGuy), obtained a boat from a family friend. Lizzy Belle, a twenty-eight foot wooden Herrshoff built in 1968 was a wreck. She didn't float, had no engine, no masts or sails, needed rewiring, new woodwork and thousand other things I don't even know about. NewGuy literally lived on this boat all non-winter months since he took possession of her and has slaved every spare moment to restore her to a beautiful sea worthy yacht. He has been relentlessly planning for this trip for a year and I feel very honoured to be given the opportunity to tag along on a voyage like this, especially given the fact that I have no idea how to sail…. Will we have a leisurely sail to the Caribbean sipping mojitos the whole way? Will I discover that I'm a huge wimp who can't cut it on a sailboat? Will we be lost at sea? Will we still be friends after this? 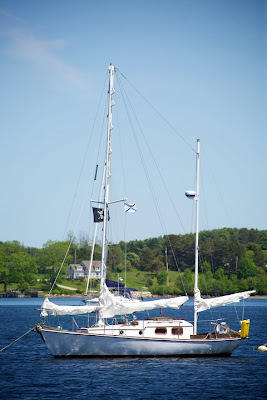 Will I decide sailing is the only life for me, give up my career and become a pirate? I guess we will find out together. Thanks for visiting the blog, I'll update when I can. You are becoming a travel blogger/vlogger like me I see! Sounds like you are going on an epic trip! My only sailing tip "To remember Port and Starboard remember that Port has the same amount of letters as Left and then that leaves you with starboard being right of course"
Good opening post. Glad to see you can write. I'm in. You've set us up for some wild adventures and personal uncertainty = good drama!